I read the post skinny people. I so think the same way. Thanks for sharing that. Happy Blog Birthday. Can you send me that cupcake. ha ha.Have a great weekend. It's amazing how fast the runnerds thing came off the ground and how many loved it, isn't it? :0) Yay Runnerds!! mmm that cupcake does look good. Congrats on 2 years of blogging. I really hope we can meet up for the UV race. I am thinking of putting together a blogger meet up at Yogurtland or something the Friday before around 5pm. Do you think you could make it? Happy Blog Birthday! Just clicked a thumbs up for ya! 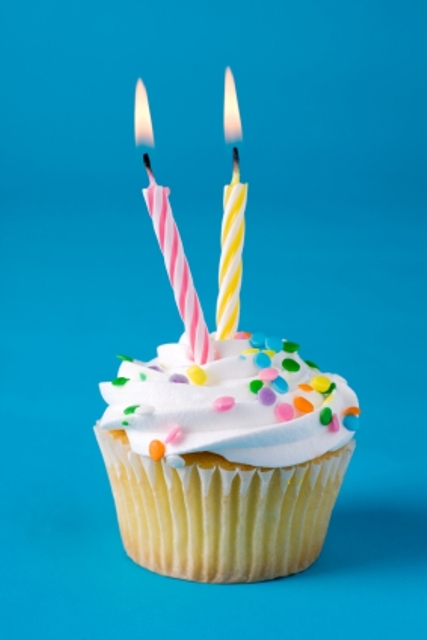 Only 2 years of blogging? We have so much more to look forward to! But you may have already exhausted your best post titles, like spitting on a cupcake and underroos. Ha! Hmmmm. Premature? Maybe. Congrats on top 25! You deserved it from Day 1. A Letter to My Treadmill was a unique post. You sure do love, and never dread, Millie. Happy blog-irthday! I love your blog, i heart you and i adore your girls!